a new series looks at how the evolution of paint analysis including fluorescence microscopy and protein staining can help us understand far more than what color our historic buildings were painted – while shinning light on a colorful past we often think of in chaste shades of gray . 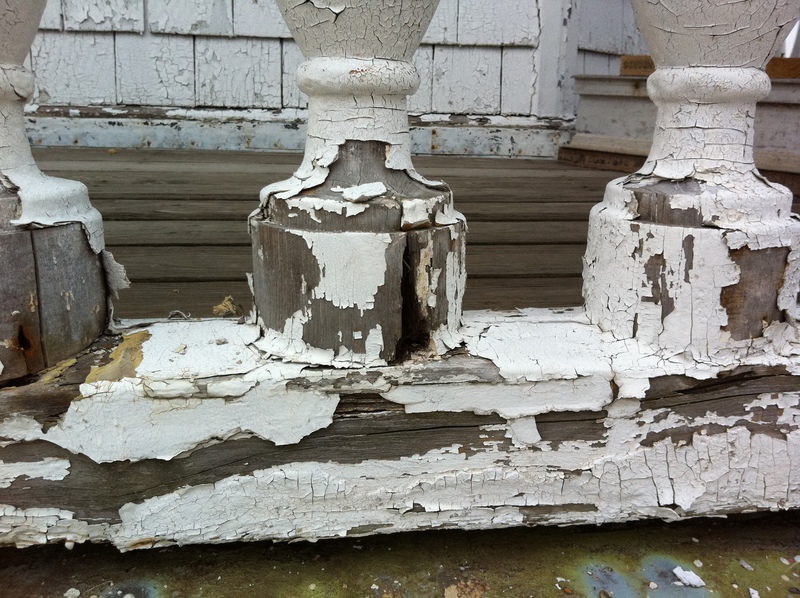 In studying an historic building to learn about its original form and the alterations, additions, and repairs that it has undergone, paint analysis can be a powerful tool to unlocking its secrets. One of the earliest field methods for paint analysis was to sand a crater in the paint polishing to 600 grit with a little oil or mineral spirits. Visual examination of a paint chip can give some information. Use of a loupe at low power allows you to roughly estimate the number of layers and colors. 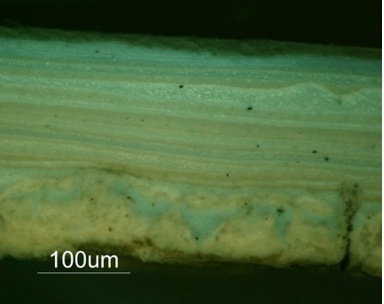 A tiny chip of paint cast in a clear resin and polished as a cross section can be viewed under a regular light microscope for even more detail. With fluorescence microscopy you can not only determine the colors but distinguish each layer even when the same color has been applied multiple times and determine the type of coatings used (emulsion, oil, natural resin, latex etc.). Understanding the types and sequence of finishes can help in dating the coatings. SEM (scanning electron microscopy) and XRF (X-ray fluorescence) can help identify pigments which often will narrow the date range of use. 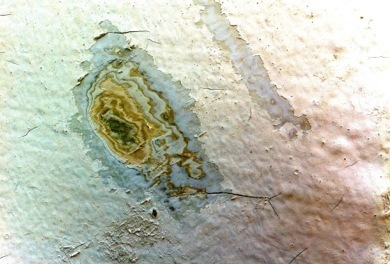 Knowing the composition of paint layers can also aid in diagnosing paint failure due to incompatibility. 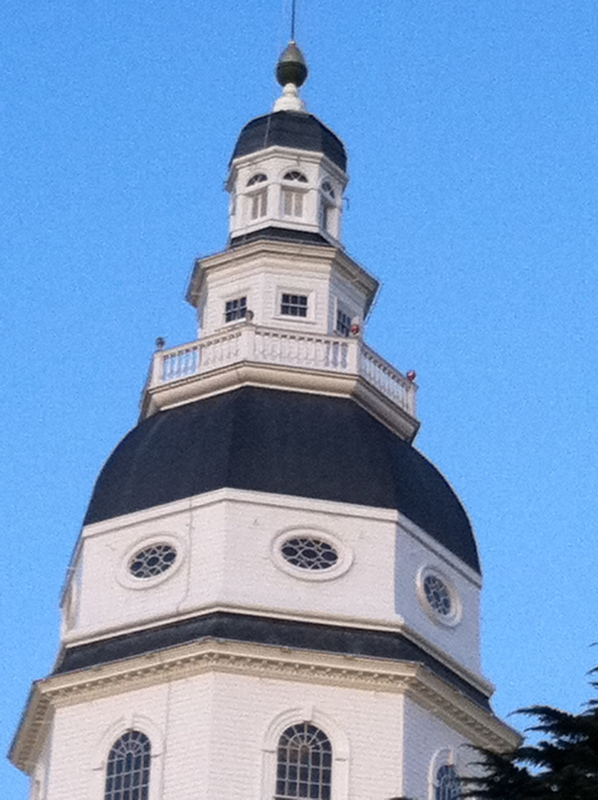 For the Maryland State House dome, incompatibility of modern latex paint over 17 layers of oil paints had caused much of the oil to fail and rapidly led to rotting of joints. Up close, it was hard to believe the dome had been “restored” only a decade earlier. What would become even harder to understand however, was how the dome continues to be rendered in white and gray. Understanding the composition of the paints already in place allows for the use of selective paint strippers to remove some layers while leaving the rest intact. 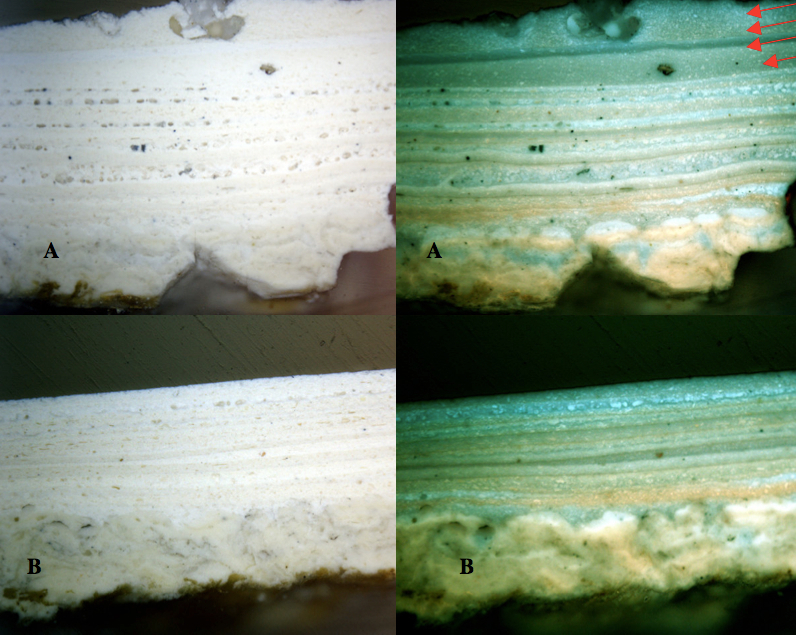 When incompatible coatings cause layers beneath to separate and cleave, the microscopy can identify this so that a penetrating resin can be applied that will re-adhere them. For the dome, we used B72 to ensure the edges of original paint were well-adhered wherever adjoining paint had failed back to wood. We will explore the paint microscopy process in upcoming postings. For now let’s look at one recently completed project: restoration of the State House Dome where we were able to retain the vast majority of the paint history in place. 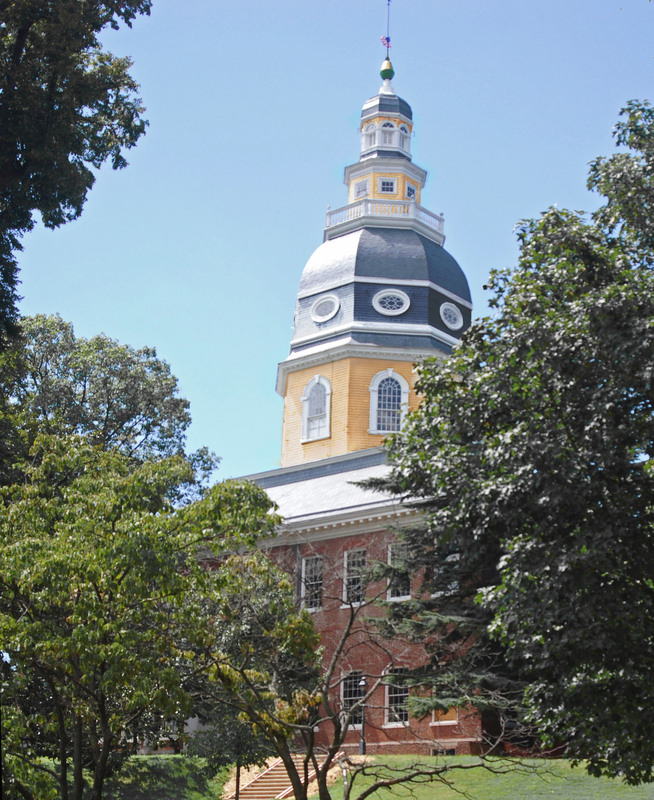 The Maryland State House dates to 1779 and the current dome was completed in 1792 after storm damage to several earlier versions. 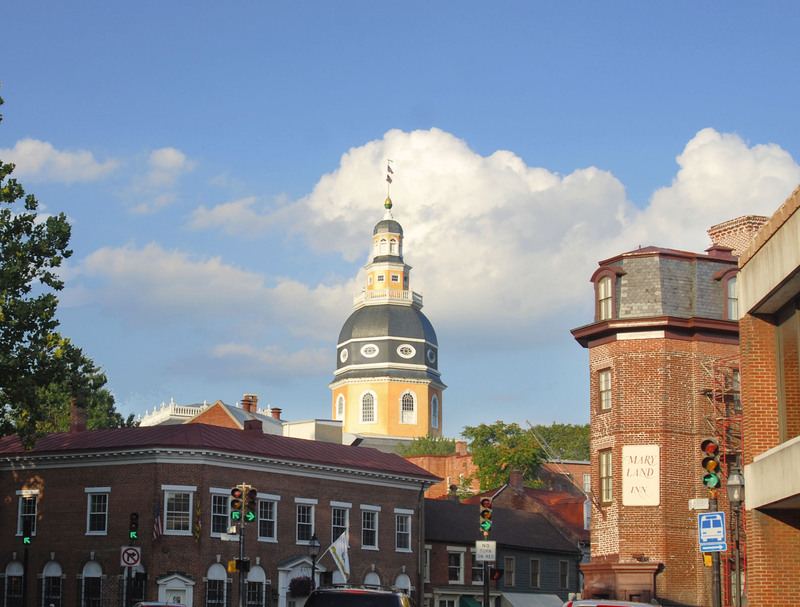 This is the oldest continuously operating state house in the country and the Old Senate Chamber of the Maryland State House was where George Washington resigned his military commission in 1783 and, the following spring, where the Treaty of Paris was ratified, officially ending the Revolutionary War. 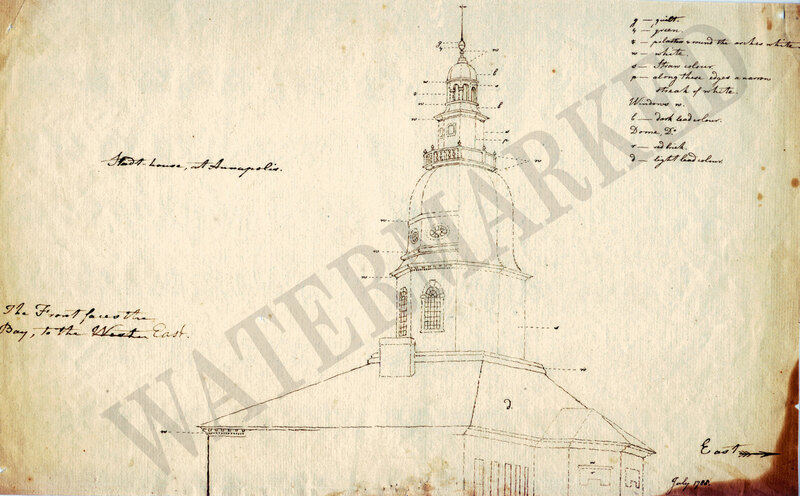 At that time, Maryland’s State House was also functioning as the national capital. More on this history is available on Wikipedia. Although restored less than a decade earlier, signs of failure on the dome were quick to show, even as viewed from the ground. 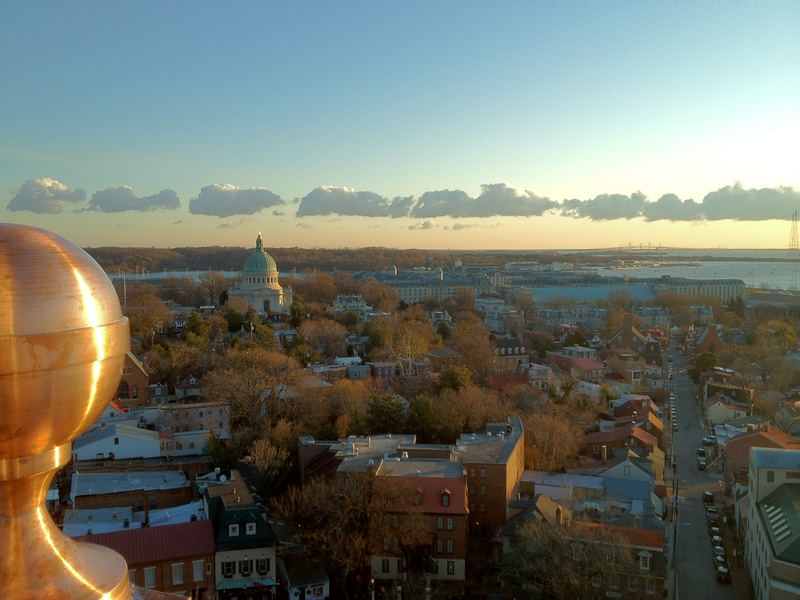 As we prepared to restore the dome – which would require expensive scaffold access – we had to first determine the main cause of failure and decide where our efforts would be focused. We did this by taking samples where the dome sat on the flat roof of the State House and at the balcony level which exits from inside the dome 2/3rd of the way up. We concluded the main issue was paint incompatibility. 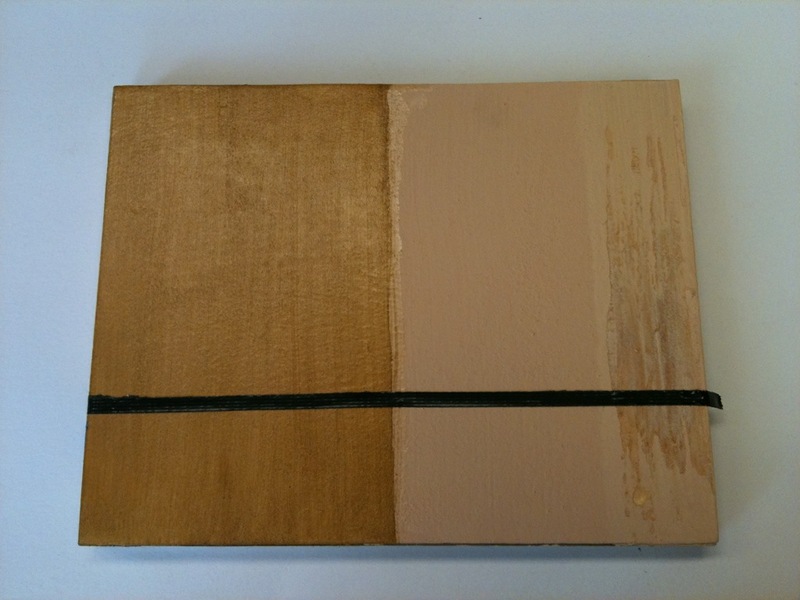 The paint failure was largely the result of very heavy layers of latex being applied over 17 layers of oil. Latex is a fantastic way to strip earlier paints. This is largely due to water moving through latex paints, causing them to expand and contract. This movement exploits weakened oil layers as it tugs at the surface. 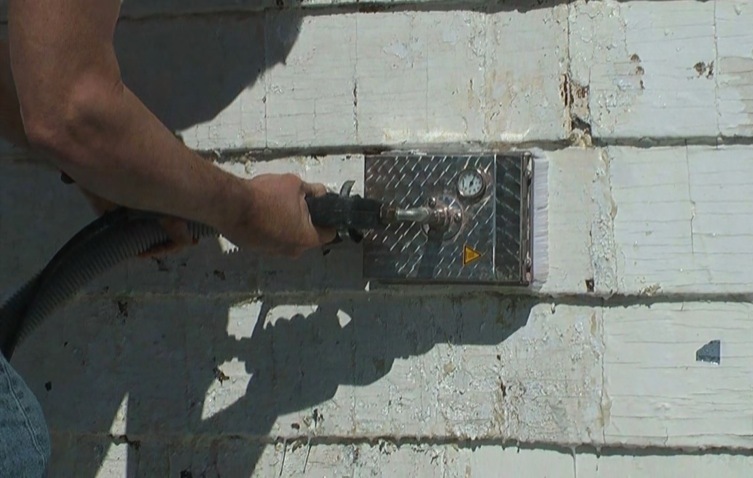 The installation of caulking was also trapping water in the wood shingles that had always been able to breathe, causing the shingles themselves to swell. . Our main focus would be to remove the latex and get back into sound layers of oil paint, while re-establishing the original breathability of the dome system. What we found in the process of looking for the physical evidence was that it also added to our understanding of the archival record. The paint evidence both confirmed contemporaneous annotations and added to our understanding of the involvement of an important artist in the dome’s expression. What was particularly compelling about our look at the paint history was finding that much of the dome had originally been painted a peachy-flesh tone that was over-coated with a golden glaze. It appeared the intended effect had been a golden dome – on the cheap since resources right after the Revolution were limited. In fact, although the original glaze used might not have held up for long, the golden appearance had been maintained – although in a single coat application of paint – two more times before the color scheme changed. Could it really be correct that the demure gray and white everyone was accustomed to was inaccurate? Clinking will send you to this image on the Maryland Archives website. Even more interesting was that where the color of one band was not not annotated we would find during the project that they appeared to have been testing out color schemes back and forth and back and forth in rapid succession because the earliest paints showed no sign of dirt deposition or weathering. So was Peale on site while they were making these color decisions?? Peale’s involvement in recording the paint treatments seen on the dome makes the manner in which the “straw” was achieved far more interesting. Most colors of this period were built up out of several hues and the peach tint that was used as a base for the glaze is the shade used for all female elements in art of the era (the solidity of men was expressed in grayish stone hues). .
Now hidden beneath white-painted slate and cedar shingles with just a hint of naked slate remaining, the evidence remains to inform the future. Never should we assume the past was sepia-toned as the earliest photographs of our ancestors have caused us to believe. Rather than think of them as an artist’s flight of fancy, the works of period artists can often help us to understand the interior and exterior palettes of the era. We hope this blend of archival and physical evidence informing our past has been a good introduction into what paint microscopy can tell us about our more colorful past. 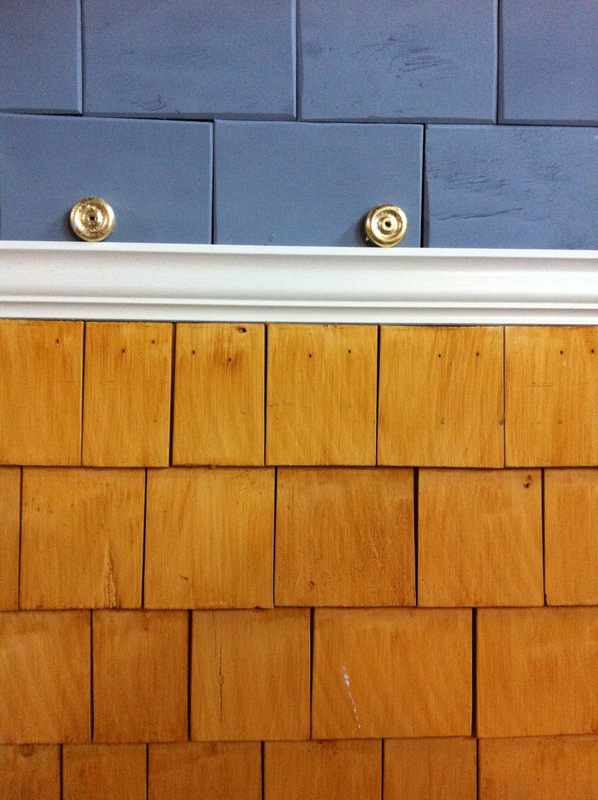 There is a tendency on preservation projects to sample historic finishes and then obliterate them. To hope that having recorded this information will somehow inform the future is pure fantasy. Most organizations can not find a ten-year old report, let alone anything older. And most of the time they would not even think to search those earlier documents. We must maintain the evidence in place if it is to inform the future – especially as our ability to analyze the remaining information expands with new means of analysis nearly every decade. The paint evidence on this project is fascinating for the curious, so it is unfortunate the polychrome history was not revealed or re-established for public interpretation. In upcoming posts we will show the results that came from projects that allowed full interpretation of the evidence, making seemingly “dumpy” little buildings that contractors might have felt they were “stuck with” into icons that everyone could appreciate. Far from a simple color analysis tool, in the next few posts we will look further at how fluorescence microscopy can confirm or deny our suspicions, while providing great insight into the past. It can provide important information that helps design and guide the treatment process. 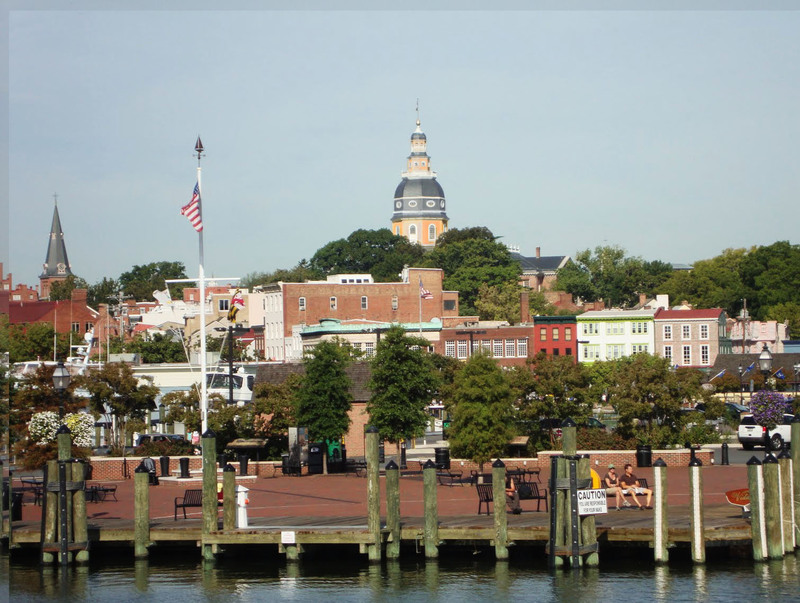 View from the harbor. Renderings of the early paint scheme by Malcolm Dax.